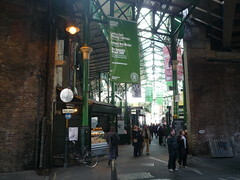 Borough Market near London Bridge has a wide range of produce to peruse and drool over. Luckily free samples can help with the latter. 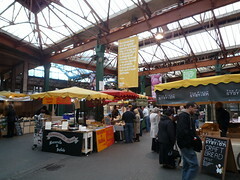 Personally, I thought there would be more stalls but there are still a reasonable amount ranging fom breads to beers. 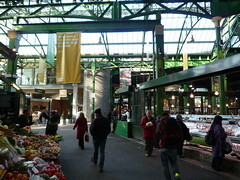 Some of the fresh produce available includes fish and meats strung up and of course fruit and vegetables. I bought an espresso beer and it was a little too harsh for my sweet tooth but there plenty of other options available at this specialty vendor. I also liked the look of the olive cart – plenty of options. Around the edge of the market you’ll also find a number of coffee shops to rest up after shopping and before further exploring the city. 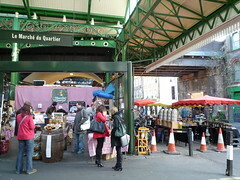 I’m not a big market person but it was still enjoyable to wander through and look at all of the goods on display. Although it’s quite famous and perhaps I’m blind but I didn’t notice much signage at the station to point the way luckily Google Maps or a shockingly helpful person should assist you in getting there. Must be the time of year — not much to harvest yet. Because when I was there, a bit later in the year (late May, I believe), you could hardly move, vendors were packed in so tightly.